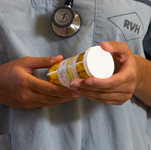 Once your pharmacy connects to the Drug Information System, a medication profile will be created for you in the system the first time you have a prescription filled. After that, all of your prescriptions will automatically be added to your profile. Your medication profile in the Drug Information System will be linked to your health card number; your pharmacy will be asking for this number when you get a prescription filled. Your profile may also contain other medication-related information about you that is important for healthcare providers to know when they are caring for you – information such as allergies, adverse reactions and medical conditions. Your healthcare providers will have the ability to add this information to the system. The more comprehensive your profile is, the more value it adds to clinical decisions about your care. Other pharmacies and authorized healthcare providers who are caring for you will be able to access your comprehensive medication profile. They will be able to see the information it contains and will be able to update information as required. Your medication information will be available anytime and anywhere in the province it is needed. Access to your medication profile is governed by Nova Scotia’s Personal Health Information Act (PHIA). Your profile is to be accessed only by healthcare professionals providing care to you; all access to your profile is recorded and you have the right to know who has accessed it. The Drug Information System will also allow prescribers, such as physicians, nurse practitioners, dentists and optometrists, to create prescriptions for you electronically or e-Prescribe. This means you may not receive a paper prescription, rather your pharmacy will be able to access your prescription electronically from the Drug Information System and fill it for you. This will help to reduce errors associated with hand written prescriptions. The Drug Information System will contain your medication information from the day your pharmacy and your healthcare providers connect to the system. Your historical medication information on file with your pharmacy and your healthcare providers prior to connection to the Drug Information System will not be included in your medication profile. The Drug Information System will not change the services that your pharmacy provides. You should continue to use the same pharmacy for your prescriptions wherever possible. Your pharmacy will be asking for your health card number. Your medication profile will be linked to this number.